When, to Whom and Where Were the Tablets Revealed? 6 Apr 8 United States & Canada Alaska, Mexico, the 6 Central American Republics of Guatemala, Honduras, Salvador, Nicaragua, Costa Rica, Panama. Belize (or British Honduras). The Indian peoples. The islands of the West Indies: Cuba, Haiti, Puerto Rico, Jamaica, the Lesser Antilles, Bahama Islands, even the small Watling Island, the two black republics, Haiti and Santo Domingo in the Greater Antilles. Bermuda. The republics of Colombia, Ecuador, Peru, Brazil, British Guiana, Dutch Guiana, French Guiana, Bolivia, Chile, Argentina, Uruguay, Paraguay, Venezuela. Islands: Falkland Islands, the Galapagos, Juan Fernandez, Tobago and Trinidad. The city of Bahia in Brazil. 1953-1963 – the Guardian unveiled the Ten Year Crusade, giving every Bahá’í the mandate to fulfil the Tablets of the Divine Plan. Bahá’ís who settled virgin countries and territories were designated “Knights of Bahá’u’lláh”. O Thou Incomparable God! O Thou Lord of the Kingdom! These souls are Thy heavenly army. Assist them and, with the cohorts of the Supreme Concourse, make them victorious, so that each one of them may become like unto a regiment and conquer these countries through the love of God and the illumination of divine teachings. O God! Be Thou their supporter and their helper, and in the wilderness, the mountain, the valley, the forests, the prairies and the seas, be Thou their confidant—so that they may cry out through the power of the Kingdom and the breath of the Holy Spirit. O God, my God! Thou seest me enraptured and attracted toward Thy glorious kingdom, enkindled with the fire of Thy love amongst mankind, a herald of Thy kingdom in these vast and spacious lands, severed from aught else save Thee, relying on Thee, abandoning rest and comfort, remote from my native home, a wanderer in these regions, a stranger fallen upon the ground, humble before Thine exalted threshold, submissive toward the heaven of Thine omnipotent glory, supplicating Thee in the dead of night and at the break of dawn, entreating and invoking Thee at morn and at eventide to graciously aid me to serve Thy Cause, to spread abroad Thy teachings and to exalt Thy Word throughout the East and the West. O Lord! Strengthen my back, enable me to serve Thee with the utmost endeavor, and leave me not to myself, lonely and helpless in these regions. O Lord! Grant me communion with Thee in my loneliness, and be my companion in these foreign lands. O God, my God! Thou seest how black darkness is enshrouding all regions, how all countries are burning with the flame of dissension, and the fire of war and carnage is blazing through out the East and the West. Blood is flowing, corpses bestrew the ground, and severed heads are fallen on the dust of the battlefield. O Thou Almighty! We are Thy servants and Thy poor ones; we are remote and yearn for Thy presence, are athirst for the water of Thy fountain, are ill, longing for Thy healing. We are walking in Thy path and have no aim or hope save the diffusion of Thy fragrance, so that all souls may raise the cry: O God, “Guide us to the straight path.”2 May their eyes be opened to behold the light, and may they be freed from the darkness of ignorance. May they gather around the lamp of Thy guidance. May every portionless one receive a share. May the deprived become the confidants of Thy mysteries. O My God! O my God! Thou seest me in my lowliness and weakness, occupied with the greatest undertaking, determined to raise Thy word among the masses and to spread Thy teachings among Thy peoples. How can I succeed unless Thou assist me with the breath of the Holy Spirit, help me to triumph by the hosts of Thy glorious kingdom, and shower upon me Thy confirmations, which alone can change a gnat into an eagle, a drop of water into rivers and seas, and an atom into lights and suns? O my Lord! Assist me with Thy triumphant and effective might, so that my tongue may utter Thy praises and attributes among all people and my soul overflow with the wine of Thy love and knowledge. O God! O God! This is a broken-winged bird and his flight is very slow—assist him so that he may fly toward the apex of prosperity and salvation, wing his way with the utmost joy and happiness throughout the illimitable space, raise his melody in Thy Supreme Name in all the regions, exhilarate the ears with this call, and brighten the eyes by beholding the signs of guidance. O Lord! I am a broken-winged bird and desire to soar in Thy limitless space. How is it possible for me to do this save through Thy providence and grace, Thy confirmation and assistance. O Lord! Have pity on my weakness, and strengthen me with Thy power. O Lord! Have pity on my impotence, and assist me with Thy might and majesty. O Lord! Should the breath of the Holy Spirit confirm the weakest of creatures, he would attain all to which he aspireth and would possess anything he desireth. Indeed, Thou hast assisted Thy servants in the past and, though they were the weakest of Thy creatures, the lowliest of Thy servants and the most insignificant of those who lived upon the earth, through Thy sanction and potency they took precedence over the most glorious of Thy people and the most noble of mankind. Whereas formerly they were as moths, they became as royal falcons, and whereas before they were as brooks, they became as seas, through Thy bestowal and Thy mercy. They became, through Thy most great favor, stars shining on the horizon of guidance, birds singing in the rose gardens of immortality, lions roaring in the forests of knowledge and wisdom, and whales swimming in the oceans of life. 2 The three Charter documents in the Bahá’í Faith are (1) the Tablet of Carmel that contains significant allusions to the establishment of the Word Centre, (2) the Tablets of the Divine Plan that call for systematic expansion of the teachings of Bahá’u’lláh throughout the world, and (3) the Will and Testament of ‘Abdu’l-Bahá that outlines the Administrative Order. This calligraphy and paste-paper on which it is written were done by Bertha Petruski. She wishes them to be used by Baha’is for any teaching or comfort they may bring. Along with Baha’i quotes there are some Biblical quotes and non-Baha’i sayings which have inspirational messages. 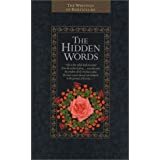 Bertha has been a Baha’i and calligrapher for about forty years and lives in Massachusetts, USA. Feel free to use and distribute widely!